Did you know that one of the last battles of World War II happened just seven miles off the coast of Block Island? The story was featured in a documentary we aired in December, Last Voyage of U-853. Now, for one week in September, the remnants of the battle will be explored. A team of University of Rhode Island oceanographers, engineers and students will spend four days in September investigating the underwater remains of a German U-boat with a state-of-the-art remotely operated vehicle (ROV) and HD cameras. Scientists, divers, archaeologists associated with the Inner Space Center and Research Vessel (R/V) Endeavor are making history, and we want you there with us. 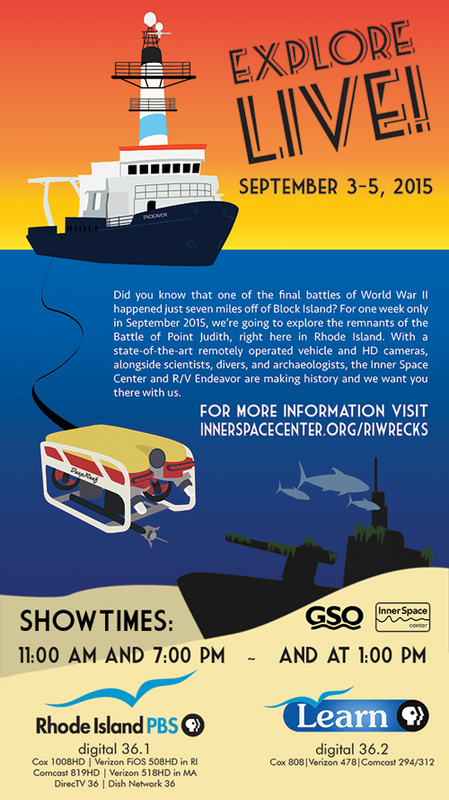 Rhode Island PBS is proud and excited to partner with the oceanography scientists at the University of Rhode Island to bring live coverage of the R/V Endeavor's dives as the crew explores shipwrecks off the Rhode Island coast. On Thursday, Friday, and Saturday, September 3-5, we will carry the live feed three times a day: 11 a.m. and 7 p.m. on Rhode Island PBS (digital 36.1), and at 1 p.m. on Learn (digital 36.2). Each visit will be about 30 minutes long (regular programming will be preempted) and include interviews with participating experts, historical footage, and highlights from the previous day’s underwater investigations. The 7 p.m. program will broadcast live images of the wrecks from the remotely operated vehicles, with commentary from the scientists, archaeologists and scuba divers knowledgeable about the site. 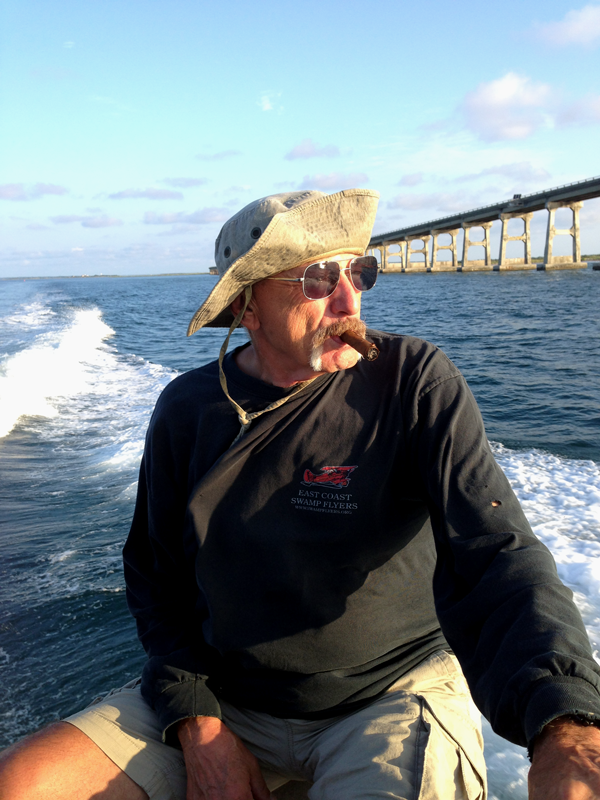 Captain Bill Palmer, who has explored the wreck and was featured in the documentary is expected to be on hand, too, during the three days of dives. The full expedition spans Sept. 2 to 6. Working aboard Endeavor, scientists and historians will examine the health of the wrecked submarine U-853, create a high-definition map of the site, and investigate the marine life around the sunken vessel. “This is a great opportunity for school classes, amateur historians and the general public to learn the intriguing history of U-boat 853 and go behind the scenes of an oceanographic expedition,” said Dwight Coleman, director of the URI Inner Space Center who will lead the project with URI archaeological oceanographer Michael Brennan. U-853 torpedoed the freighter S.S. Black Point on May 4, 1945 while the freighter was carrying coal to Boston. 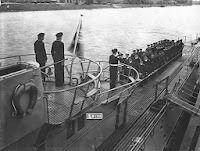 A day later the German submarine was sunk by depth charges deployed by the Coast Guard frigate Moberly and Navy destroyer Atherton. Located in waters about 130 feet deep, the wrecks of the U-boat and Black Point are now popular scuba diving sites. Both will be visited during the URI expedition. For those who would like to see more of the work being done, cameras located throughout the ship and on underwater remotely operated vehicles will stream live images to the URI Inner Space Center throughout the five days of the investigation. The public can tune in at any time for free at www.innerspacecenter.org/riwrecks. The expedition is funded by the Rhode Island Endeavor Program, a state-funded effort to provide URI researchers and local educators with access to the scientific research and educational capabilities of an ocean-going research vessel. 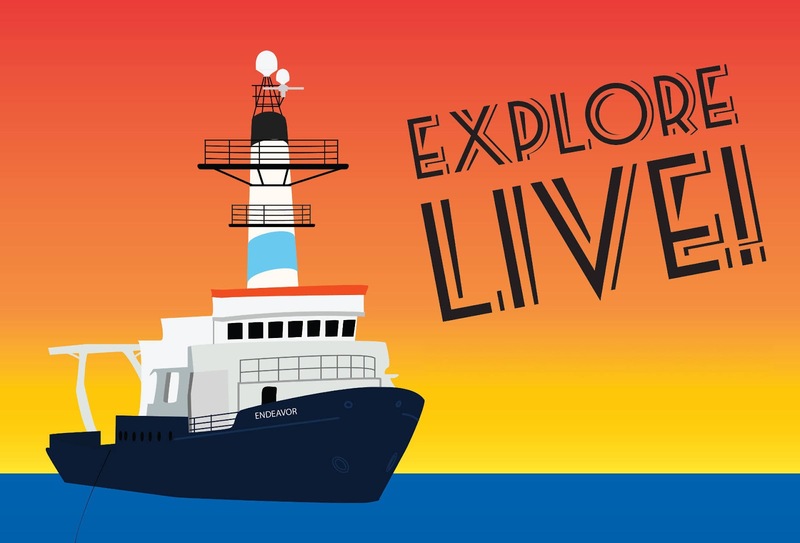 Teachers Tiffany Risch of Coventry High School and Shannon Donovan of Scituate High School will be aboard ship to observe and assist in all aspects of the expedition and participate in live chats with school classes. Among the others participating in the event will be Steven Licht, URI assistant professor of ocean engineering, and his graduate student Jordan Kirby, who will run the remotely operated vehicles and test a new robotic arm they are developing; URI Professors Thomas Rossby and Godi Fischer, who will conduct several underwater acoustics tests of a device they have invented; and Capt. Rich Sanders, a professor at the U.S. Coast Guard Academy, who studies the degradation of shipwreck sites to assess their risk to the environment. Be sure to tune in for this rare opportunity. And spread the word! Share this information with your children, teachers you may know, as well as anyone with an interest in maritime history and history-making technology! For more information on this and other expeditions, visit the Graduate School of Oceanography (GSO) Website, and check out the amazing innerspace center, too.